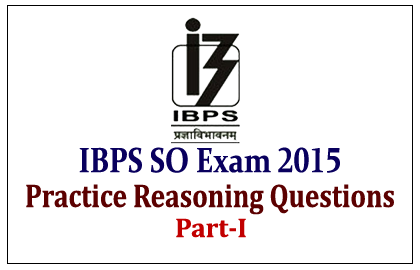 List of Model Reasoning Questions for the upcoming IBPS Specialist Officer Exam 2015 were given below. Candidates those who are preparing for those exams can use these questions to score more marks. 1).How many such pairs of digits are there in the number 531468 each of which has as many digits between them in the number as when the digits are rearranged in descending order within the number? 2).Pointing to girl, Subodh said “she is the daughter of my mother’s only brother”. How is Subodh related to the girl? 3).In a certain code CONQUERS is written as MNBRQDT. How is STEAMER written in that code? 4).The positions of the first and the fifth digits in the number 83241957 are interchanged. Similarly the positions of the second and the sixth digits are interchanged and so no. Which of the following will be the third from the right end after the rearrangement? 5).The positions of how many digits in the number 5321648 will remain unchanged after the digits are rearranged in ascending or der within the number? 6).In a row of twenty students, R is fifth from the digits end and T is fourth from the left end. How many students are three between R and T in the row? 7).How many meaningful English words can be made with the letters NLAE using each letter only once in each word? 8).Among A, B, C, D and E each having a different amount of money, C has more money than only E, B and A. who among them has the highest amount of money? 9).How many such pairs of letters are there in the word PERFORATE, each of which has as many letters between them in the word as in the English alphabet? 10).Nikhil walked 30 meters towards East, took a left turn and walked 20 meters. He again took a left turn and walked 30 meters. How far and on which direction is he from his starting point?